The Tuscan Salad Mix is one of a series of blends which provide a wide variety of colourful and tasty salads. 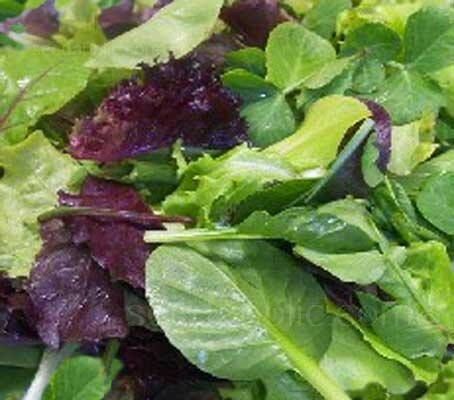 These salad leaf mixes have been selected from varieties with comparable growth rates and compatible textures and flavours to provide interesting and tasty baby leaf salads which are ideal for home growing and ideal for stir fry or salads. This is an exiting mix of vibrant colour and incomparable textures of salad in its youth and is made up of classic Italian leaves that will enhance presentation and flavours of any dish. Each of the mixes can be grown all year round, for a continuous supply of tasty and nutritious baby leaves. They can be grown in the home, on windowsills or raised in pots in glasshouses or polytunnels in cooler areas for winter early spring crops. The time from sowing to harvest can be as little as 28 days, harvesting when the leaves are between 12 and 15cm tall (5 to 6in) and although re-growth can be harvested, it is better to sow little and often for continuity. Chicory Italico Rosso - Serrated leaves with red ribs. Rocket Dentellata - Typical wild rocket leaf shape, Mild flavour. Lettuce Lollo Rossa - Red, frilled and serrated leaf. Lettuce Catalogna Cerbiata - Green Oakleaf type. Kale Nero de Toscana - Heavily blistered, dark grey-green leaves. In autumn and winter seed can be sown into pots or seed trays which can be grown on the kitchen windowsill or in a heated conservatory/greenhouse. Sow 20 to 30 seeds into a 10 to 12cm pot using a free draining compost and cover seed lightly after sowing. For spring and summer crops, sow direct into prepared seed beds in the kitchen garden or greenhouse border, and this is the best growing technique for spring and summer crops. When sowing outdoors sprinkle seeds ½in apart in a 2 to 4in wide row covering lightly or broadcast sow. Tip a small amount of seed into your hand, take a pinch and spread thinly along the trench. Cover with soil, label and water. If birds are a problem in your garden, spread netting to prevent them eating the seed. Sow every two weeks for a continual supply of tender young leaf. The best tasting leaves come from plants which are grown quickly; this means a temperature of 15 to 19°C (60 to 70°F). Under optimum growing conditions a crop of salad leaves can be ready for picking 3 to 4 weeks from sowing. Slower growing crops can become more fibrous and hotter flavoured. Once cut the plants should have sufficient energy for regrowth to provide a second or even third crop of leaves, giving a regular supply with "little and often" sowings. Harvest after approx three weeks by clipping with scissors, most plants in the mix will regrow. Avoid following radicchio, endive, escarole or artichoke. Can be sown all year round.